One hurdle to staging the next America’s Cup on San Francisco Bay is the locals’ expectation that we’ll F it up, given the opportunity. There’s still room for that, but there is no excuse. 1) Larry Ellison still wants to stage AC 34 on his home waters, in front of Golden Gate Yacht Club, in a natural arena with camera-pleasing vistas and a crowd-accommodating shoreline. 2) If the city can’t get its act together, there are other places that can. Substitute wing-sailed trimarans into this picture, and you have a very good look for a 21st century America’s Cup . . .
Today’s announcement follows close on the heels of the BMW Oracle Racing tour of the East Coast, where the team was received at the White House and feted in Newport, Rhode Island, former home and would-be future home to Cup competition. Rhode Island wanted this thing in a big way. 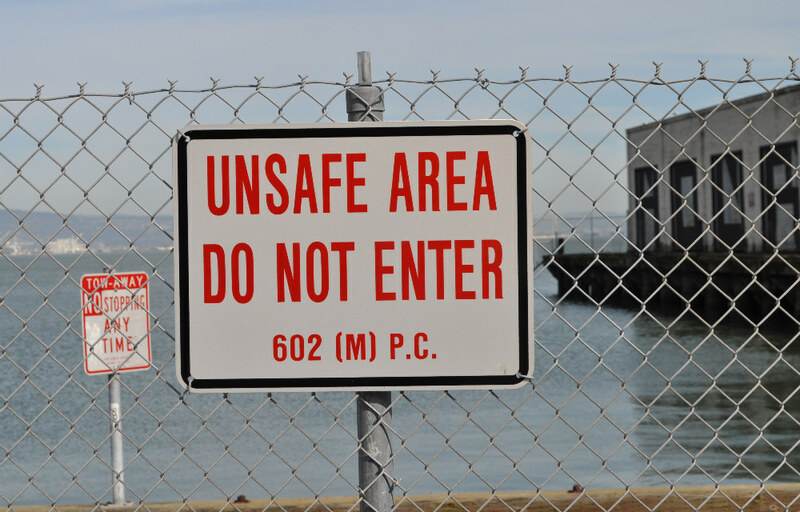 The implied threat now of an American defense in European waters, as the only alternative to San Francisco Bay, comes as one hell of a statement. That flutter about “500 million euros and a city in Italy” has never quite washed away. “Includes city-front facilities, extensive investment in infrastructure, and significant sponsor financial support — to say nothing of San Francisco’s strong reliable breeze and a natural racing ‘arena’ which should make for excellent TV. So, not a done deal. But if Larry Ellison wants to secure his place in history, he will find a way to defend the America’s Cup in American waters. 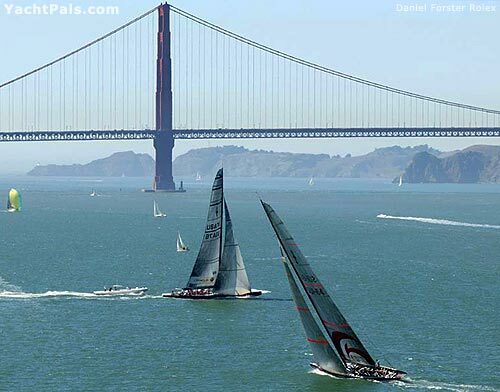 And San Francisco wants the America’s Cup. 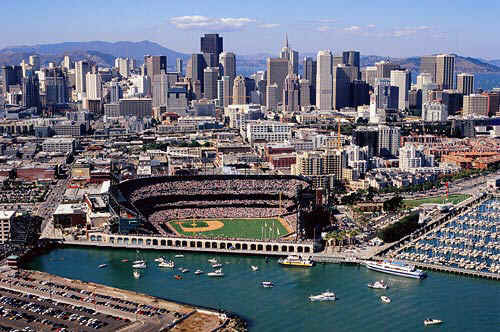 And San Francisco needs the Cup. And I’m a believer in making it happen. Once upon a time this was a vibrant commercial port known as Frisco, with longshoremen swarming the docks, onloading and offloading cargo for all of the American West. The city long ago forfeited that heritage and went boutique, letting the shipping industry move to Oakland as it containerized, and leaving the piers to crumble. 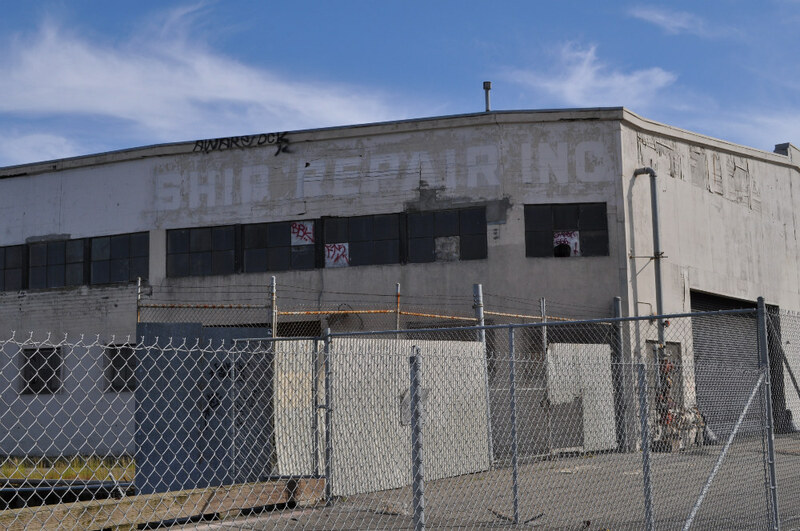 Tour the San Francisco Embarcadero today and you will find redeveloped piers north of the Bay Bridge (restaurants, entertainment, rides) and other piers south of the bridge rotting away. There’s no other plan for them, and no other likely opportunity to make a redevelopment pay off. This is not a good look . . . When it could be much more like Valencia ’07 . . .
BMW Oracle also sent out an aerial view showing a tip of Pier 50 and its proximity to AT&T Park, already a place where baseball fans are accustomed to seeing views of sailboats and the occasional sailing race. Pier 50 is close enough to downtown to draw crowds but sufficiently removed from the hubbub of bridge traffic on the Embarcadero to make excellent sense, and I take this as a strong hint that it is the preferred location for an America’s Cup Village. Pier 50 shows up at the bottom of the image . . .
Mayor Gavin Newsom’s office promises to release an economic study next week, appraising the impact of an America’s Cup here, including construction jobs and increased tourism. Part of the value is the long cycle. 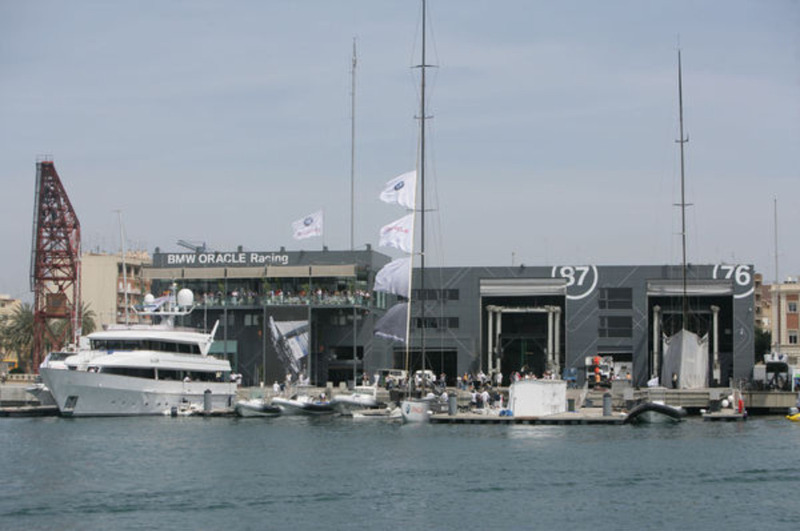 There will be pre-events, and the racing teams will be in their bases at least a year ahead of the America’s Cup match. Then follow several months of competition, all of it beamed to the world. How much was it worth to the city to have The Streets of San Francisco filmed here? Valencia spent something close to 150 million euros on the 2007 Cup and claimed a return of 685 million euros, or about $1 billion US. Ellison claims there can be an even bigger boost to the economy of Northern California. And unlike Valencia, which ponied up something like half its total cost just to be named as the venue, San Francisco is not being asked for front money. The cost of infrastructure—shoreside access and one base per team; probably about an acre per—will have to come from somewhere, but the event itself is offered as a gift. 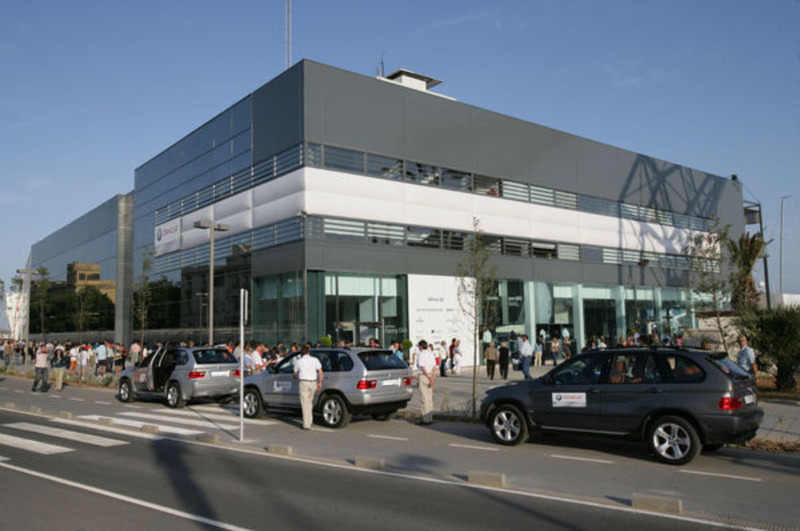 Below are some views of the BMW Oracle base in Valencia, still the team headquarters pending a final venue announcement. There is public interactive space on the ground level, with offices on the middle floor and hospitality suites at the top. Sponsoring companies use these bases for relationship marketing, hosting their best employees, best customers, and best prospects in an atmosphere unlike any other. I’ve let these images get separated from their credit lines, but I’m pretty sure they’re all from Gilles Martin-Raget/BOR . . .
A reliable seabreeze, supporting on-time starts and good television, is one factor that Ellison has cited in favor of San Francisco Bay. 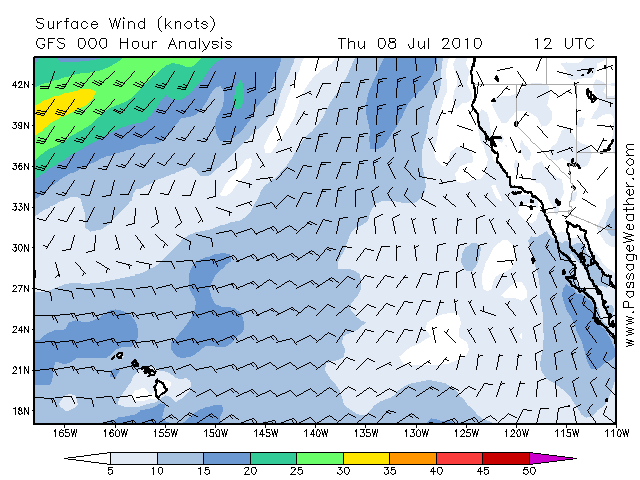 I note that the Pacific Cup race to Hawaii has been staging daily starts since Monday, all on time, all with breeze. (Until those poor suckers got offshore, but that’s a different story. AC 34 will be sailed inside San Francisco Bay, where there’s been wind all week, even under a gloomy marine layer 2000 feet thick. The story on the ocean has been grim, however, with boats struggling along on 60-mile days and 70-mile days. Sea Reine, a Beneteau 34, turned around today, citing work schedules that don’t harmonize with a creepy-crawly start to a passage of 2,120 miles. Per the event’s web site, “Today’s report shows many boats posting 100-mile or better performances.” And that’s the good news, contrasting with previous. A couple of boats, including the Cal 40, Green Buffalo, are even north of their beginning latitude, never a good sign when you’re on your way from California to any port in Hawaii, which in this case is Hanalei Bay, Oahu. Along the way, the going gets good. It’s getting away from the coast that’s ugly, as charted by passageweather.com. To advance the City’s campaign the Mayor has commissioned an economic impact study that will be released next week that will illustrate the significant financial benefits to the local, state and federal economies should San Francisco secure the host city rights. The Mayor is also forming a national America’s Cup Organizing Committee (ACOC) to marshal the private and corporate support necessary to win the campaign. Additionally, the City has already secured significant local support including resolutions, adopted unanimously from: the San Francisco Board of Supervisors, the Port Commission, the Bay Conservation and Development Commission, and the Recreation and Parks Commission, as well as letters of support from the Golden Gate National Recreation Area, Metropolitan Transportation Commission, Water Emergency Transportation Agency, San Francisco Bar Pilots Association, Port of Oakland, the San francisco Convention and Visitor’s Bureau, and San Francisco Airport, among others. 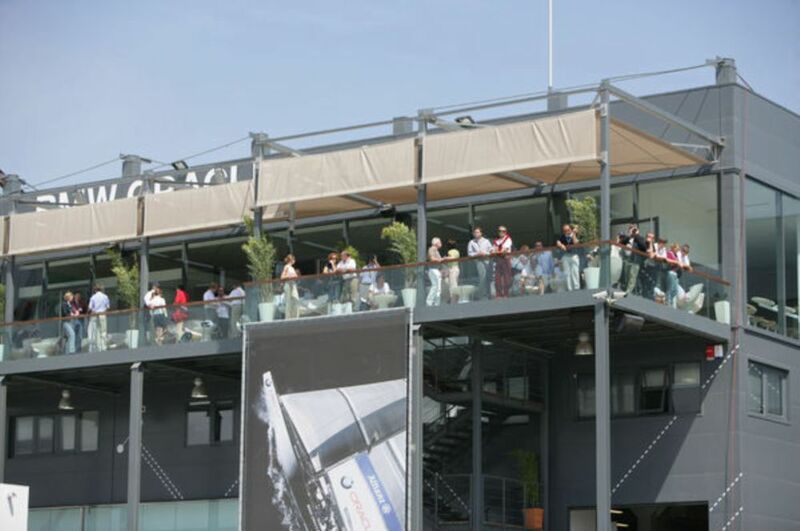 The City and its partners are eager to work with Golden Gate Yacht Club and the BMW ORACLE Racing team to finalize the proposed racing facilities on the land and water. 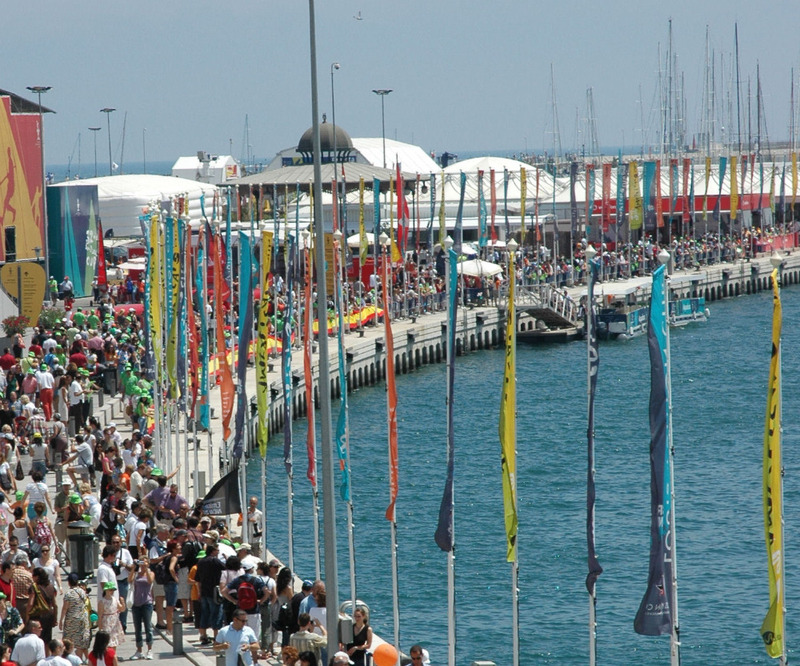 Working with the State and federal governments the City will secure the necessary approvals and commitments to meet the team’s stated deadline of selecting the 34th America’s Cup venue by the end of 2010.